I originally wrote this post in 2011. I have to say the changes I made for my home and family were exactly what I needed. Today life is very different for me. My homeschooling journey is complete, we are an empty nest and enjoying more freedom. I'm grateful for the time and energy I did spend on focusing more intently during that season of my life. It was very much worth it! I'm still on vacation and this week I wanted to share with you a few breakfast recipes. My typical Menu Monday does not include breakfast meals. So I thought I'd share a few ideas today. I've always liked this recipe because it's something you can make and have on hand all week long. In a small bowl combine yeast and warm water and let this sit for a few minutes to activate. In a large bowl combine flour, baking soda, baking powder, sugar & salt. In a medium bowl beat eggs and add oil and buttermilk. Add yeast mixture and buttermilk/egg/oil mixture to the flour. Stir to combine. Cook these pancakes at a slightly lower temp and a little longer cooking time than regular pancakes. With hot weather on its way it's always nice to have a cold beverage in the fridge. I know water is always the best choice, but sometimes it's nice to have a little change. Here are a few of my favorites (and I really try and keep them on the healthier side :)..
Cut up 4 generous cups of watermelon chunks..
Now make 2 quarts of lemonade. Measure into a one gallon container a ½ cup of honey…. Put a small amount of boiling water into the container to dissolve the hone. Stir and add 1 cup of lemon juice.. When I turned 50 I decided it was time... it was time to get more fit. I decided it was time to focus on my health more than I had been doing. The easiest thing to do was to start walking. Of course that is when I realized how very out of shape I was! :) I did not let that stop me. I've been a big fan of walking because it can be done without equipment, no membership needed, and it can even be done in the home. I don't think there is anything wrong with equipment or gym memberships, I'm not knocking them, but they can also be obstacles when starting a journey to fitness. Something you have to wait for, or wait until you can afford it, etc. Walking can be done right now. One thing I would recommend is a good pair of shoes. 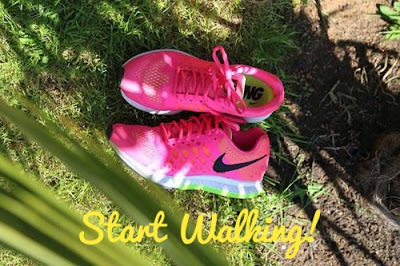 If you start walking and enjoy it you'll put a lot of miles on and good shoes are a must. We are off on our vacation so there will be no Menu Monday. Instead I thought I'd share a few recipes with you to inspire your menu making. These are definitely tried and true recipes. I've made them countless times and they are always a hit with my family. 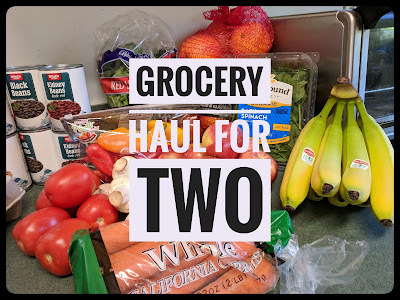 This will be the smallest grocery haul ever. Tobin and I are heading off for a little road trip and we only bought what was needed to get us through until we leave. OK, here is what we picked up at Winco.. Milk (certainly the smallest amount of milk I've ever bought! Ha, ha!! :), half n half, hamburger buns (they went in the freezer), grape tomatoes, bananas, apples and oranges. And bran which I bought in the bulk area. We have fruit and veggies that I'm working to use up before we leave. So I only bought what I knew I would need. I've enjoyed a nice lazy morning today. 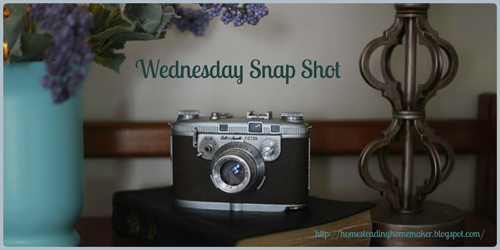 Wednesday is my hubby's day off and we both decided to just take it slow this morning. But I'm up an at it now and just started my 2nd load of laundry and got the sheets changed and the kitchen cleaned. Not a bad start to my day :). I had the best Mother's Day. It was totally unexpected by me. I'm not one who makes a big fuss on Mother's Day. I don't have expectations on my children and they know this. I've told my children what honors me the most is that you all live godly, God honoring lives. I don't need flowers or gifts or anything else like that. No matter what I always hear from them, one way or another. It may be a phone call, a text or a visit. There are things in life that bring us much joy, but sometimes joy can be elusive and there is little to no joy. 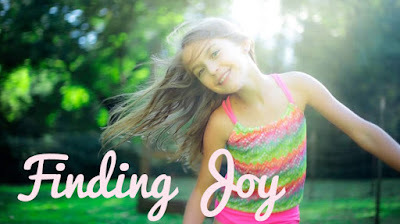 You would not think that joy is something that needs to be found, but I've discovered this year, more than other years, that it is often something that we need to seek. Towards the end of last year I was searching and thinking about my 'one word' for the year. I do this every year. Some words I quickly forget, others are a reminder for me to focus on throughout the year, but this year it has been a word that I have had to find. My word, as you may have already guessed is “JOY”.